Ryan Blaney and the No. 21 Motorcraft/Quick Lane team weren’t able to close their time together with a strong finish in the Ford EcoBoost 400 at Homestead-Miami Speedway as they had hoped, but that was only a hiccup in what has been a remarkable 88-race run for the young driver and the sport’s oldest continuously operating race team. 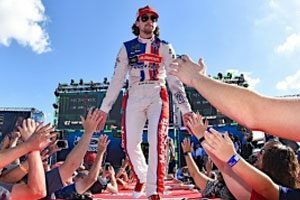 The Wood Brothers and Blaney have scored a win at Pocono Raceway, poles at Kansas Speedway and Phoenix Raceway, eight top-five and 25 top-10 finishes, 49 lead-lap finishes, 317 laps led, four Stage wins, a 9-race playoff run this season and a ninth-place finish in the final 2017 points standings. The three Blaney Years in Wood Brothers history, which were made possible by an alliance with Team Penske and support from Ford Motor Company and its Motorcraft and Quick Lane brands, have seen the team surge forward in on-track performance, gain fans off the track, raise money for charity and lay the groundwork for future success. Wood also thanked the fans who have stood by the team through the tough times of the past and the good times of late. “We have some of the most loyal fans in the sport, and while we’ll all miss Ryan, I think they’ll like what they see going forward,” he said. 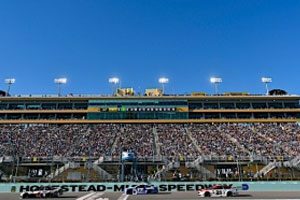 Despite the successes of recent seasons in races on intermediate tracks like Homestead-Miami Speedway, Sunday’s Ford EcoBoost 400 was a disappointing outing for the No. 21 team. After qualifying a solid 11th, Blaney faded early and was in 32nd place, two laps down after the first stage. Trapped that far behind the leaders, the team was never able to find the speed or employ a strategy to rejoin the lead lap and wound up in 29th place, three laps down. “It wasn’t the day we wanted, and it wasn’t the day the Ford teams wanted, but congratulations to Martin Truex Jr. on the championship,” Wood said. Now the focus for the Wood Brothers and the Motorcraft/Quick Lane team turns to the 2018 campaign and the season-opening Daytona 500. “We’re looking forward to the start of a new era, and we’ll go home and start getting ready to go to Daytona for the 500,” Wood said.